Journal of the Australian War Memorial, October 1983, p. 33.
the proposition was raised that the alleged Elliott photograph claimed to be the charge of the 4th LHB at Beersheba. By a number of posts, each dealing with discrete sections of knowledge, it will be demonstrated that the alleged Elliott photograph was actually a picture taken by Captain Hurley of the 9th LHR on manoevres near Deir el Belah in February 1918. This is Part 2 of the discussion. The internal evidence of the alleged Elliott photograph. One of the most fundamental methods of research is to allow the document or photgraph tell its own story. It is a process of examining the internal evidence. In this post, the alleged Elliott photograph will be examined on its own merits with the same picture available to Professor Ian Jones when he wrote his article in 1983. In that manner we can establish if the research and conclusions were accurate or deficient in dilligence prior to publication. Thus we will examine the internal evidence of the photograph. In supporting this claim by Elliott was an article written by Ian Jones called: Is This The Charge At Beersheba? and published in the Journal of the Australian War Memorial, October 1983. Page 33 of the Journal is reproduced at the top of this article. The reason for reproducing this page is to highlight the material available to Elliott and Jones which is available to everyone else through this article. So to that end, it is important to use this as the starting point to analyse the quality of scholarship produced by Jones in supporting the Elliott claim. This will allow all protagonists in this argument to begin from a common point - the published claim and reproduced photograph. One item noticable on this copy is a red circle in the background. Below is an enlargement of the scene it describes. Second Line, Charge Picture enlarged, 1. This picture is extracted from that found in the Journal of the Australian War Memorial, October 1983, p. 33, the same facilities available to Jones then and now. The picture describes two dismounted men overviewing the 2nd line. Two empty saddles indicates that the riders have dismounted. But what is going on here? What are these three men looking at? If the focus is moved to the first section of horsemen in the second line, the answer becomes clear. Second Line, Charge Picture enlarged, 2. The horsemen of the sections immediately adjacent to the two dismounted horsemen are facing towards those men. The legs of the various horses indicates that there is no movement occurring at all. They are stationary. While it is beyond the ken to know exactly the actions that are occurring at the moment this picture was taken, it appears as though the men of this section are taking instructions from the dismounted soldiers. If this is the thundering charge picture as described by Elliott, then the men in the second row are behaving quite casually and indeed are not charging at all. Below is the whole section summed up. Second Line, Charge Picture enlarged, 3. These men are not charging at all. Quite the contrary, they are standing around seemingly awaiting orders. Further compounding this situation is that of the third line. The aspect of the horses' stance indicates that the line too is standing still or not engaged in any charging action. 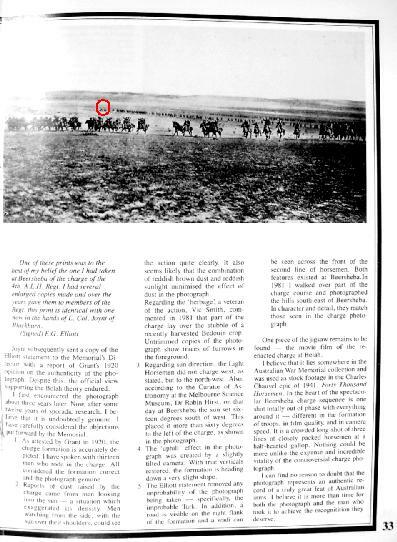 The internal evidence of the photograph leads one only to a single conclusion, it cannot possibly be the photograph of the charge at Beersheba by the 4th LHB as alleged by Elliott and supported by Jones. It would appear as though the examination of the picture by Jones was not conducted on the merits of the picture but introducing extraneous factors that have no bearing upon the subject. An examination of the internal evidence was not beyond the ability of Jones for the screening of the picture for the article meant that he had a high quality reproduction available to him. 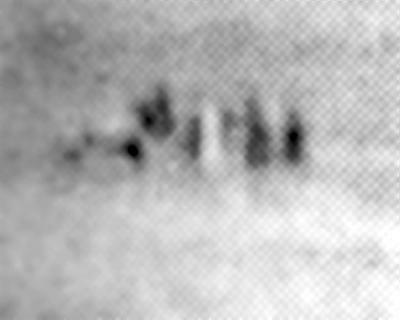 The enlargements in this post come directly from the screened photograph he had available to him at the time of publication in 1983. Nothing new has been added. The only difference between these two dates is a rigorous examination of the background in the picture, something that was absent in the initial article. One final reflection. In the latest coffee table book produced by Jones called: A Thousand Miles of Battles, it is essentially a rehash of the Time Life book from 1986 with no attempt at a serious examination of this issue and others in light of recent scholarship. While no doubt becoming a popular version of the story, its inherent inaccuracies of detail make it risible for the purposes of scholarship. Indeed, it compounds the difficulties in telling an accurate story to the public when it is shrouded in solid myth. It is this mythology that debases the contribution of the men and women to our nation during these terrible years. It makes a mockery of their sacrifice and turns them into cartoon characters. But what else can one expect from a film script writer whose job is to sell fantasy. There is no problem with people producing fictional films but there is a major problem when fiction is produced under the guise of a book written by an "academic" and then sold to the public as reality. When examining various works, indeed even this blog, it is essential to test all the information to ascertain its veracity. Elliott made a claim about a photograph which has been sustained by many over the years. When examined under forensic conditions, the claim seems to fade away. So too do the claims of Elliott's supporters. Acknowledgement: This ground breaking study would not have been possible without the expert assistance of Chris Horvath and Steve Becker, both of whom contributed their own expertise. Chris and I discussed in detail the issues related to this photograph during my visit to Perth in July 2008 while Steve Becker added a depth of technical information regarding the movement of mounted cavalry. Of course, any errors, mistakes or omissions are mine alone. Bill Woerlee.